Watching Monday morning’s “It’s show time” keynote, I was struck by how much Tim Cook is stamping his values on what Apple is doing. These are the things Cook has been pushing internally since taking over from Steve Jobs in 2011. These are the priorities of his leadership, reflecting the things he wants to get done and the internal values that guide what Apple employees do and how they do it. Monday’s keynote was a chance to witness these values in action, to see the kinds of products and services his priorities are helping to create. So we have a credit card that is expressly private. It doesn’t track your purchases and doesn’t use your data to market to you. It also educates you about your spending habits and interest rates. And the new TV subscription service appears to be less about entertainment — at least mindless entertainment — and more about educating and informing. I learned about Cook’s six values during an interview at Apple Park, Apple’s new spaceship HQ, with Lisa Jackson, the former head of the Environmental Protection Agency. Cook hired her to head up Apple’s environmental initiatives, which are transforming the company’s carbon footprint, among other things. Cook hasn’t explicitly talked about these values, and they weren’t made public until late last year when Apple added them to its website. Each value has its own webpage that is linked in the footer of Apple’s website under “Apple Values.” But before then, they weren’t something Apple talked about publicly. Instead, Cook championed them internally. “Companies should have values,” Cook has said. Education played a big part in the services Cook introduced Monday. The new Apple Card credit card has several feedback features designed to educate you about your own spending. The card’s app includes graphics that show clearly where your money’s going. It helps you keep an eye on trends, and adjust your spending if necessary. It reminds me of Apple’s Activity rings on the Apple Watch. Or the Screen Time feature, which tells you how much time you are spending staring at your devices. The credit card’s app also includes a payback wheel that shows what happens if you increase or decrease your payments, and the effect that has on interest rates. It’s a “financially healthy credit card,” said the Apple executive who introduced the card. Of course, some other credit cards and banks also have financial literacy features. And there are specialized apps like YNAB (You Need a Budget), but I haven’t seen a credit card that puts feedback so front and center. Roger Rosner, Apple’s vice president of applications, touts the privacy features of Apple News+. The new News+ app also puts education and privacy front and center. The app is powered by a team of human curators who try to keep out all the disinformation and lies that plague news aggregators like Facebook. And it shelters readers from the prying eyes of Silicon Valley. 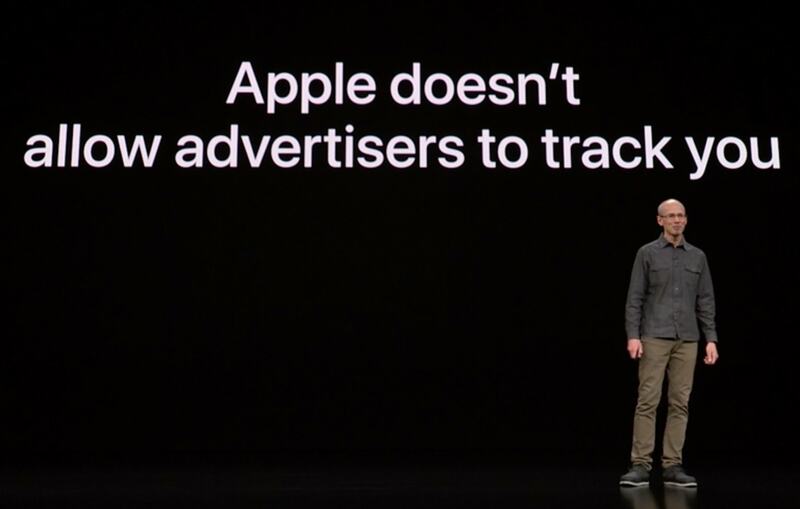 “We don’t know what you read, we won’t allow advertisers to track you,” Cook said. Compare this to Apple rivals like Facebook, Google and Amazon, which all track their users extensively. It’s the same with the AppleTV+ app. When introducing it, Cook said TV is “more than just entertainment, it’s culture.” From Monday’s sneak peek, which was light on details,, it looks like Apple’s TV efforts are more about education and information. A lot of the show previews emphasized elements of social justice and education. It seems that Apple isn’t interested in replicating what everyone else in Hollywood is doing. A lot of Golden Age TV is very dark and violent, but there’ll likely be no The Walking Dead-style gorefest on AppleTV+. Instead, there’ll be a live high-brow book club with Oprah, or the Muppets teaching you to code. Tim Cook’s TV service looks to inform and educate, rather than entertain.